David Alkire Smith, a tool engineer with more than 50 years of experience, is the editor of the "Die Design Handbook" and other engineering reference works; dsmith@smithassoc.com, www.smithassoc.com. The structure of most but not all top-driven straightside presses is held in compression by four tie rods running from the top of the bed through the columns and through holes in the bed (fabricated-plate presses built without tie-rods are an exception). If these tie rods become damaged—from press overloading or improper heating used to free a press stuck on bottom—precision will be compromised. If the tie rods do not keep the press precisely aligned, the die will not close in precise alignment. 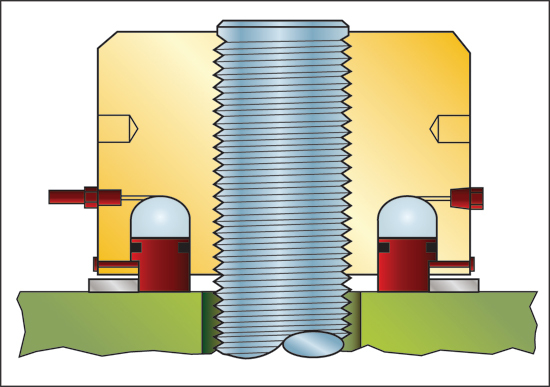 The guide pins alone cannot achieve the slide-level condition needed. How do you know if your press tie rods are loose? By checking the location of the press crown relative to the uprights when the press is cycled at full tonnage. Fig. 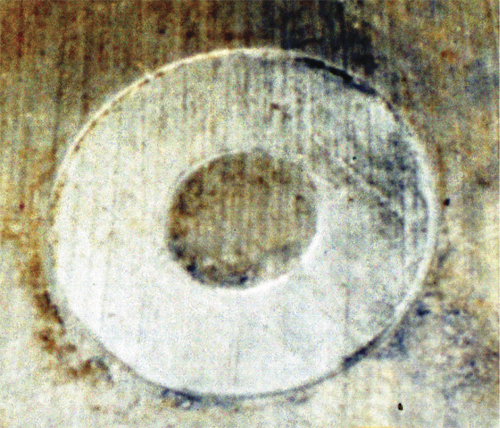 1—A die shoe imprinted with a setup-block mark. This condition can be caused by improper heating used to free a press stuck on bottom. In addition, when conducting plant audits, finding upper die shoes imprinted on the side of the press (Fig. 1) requires further inquiry. Inspectors can detect this condition visually or by feeling with a finger, and then find out if the press has become stuck on bottom and, if so, then learn how the condition was corrected. If the tie rods on just one side of the press were heated, they will have yielded and will remain loose. This will cause the upper-shoe imprinting problem on one side, as well as other problems. For example, when using a tonnage monitor with column-mounted sensors, the monitor will not provide correct readings if the column preload is not maintained. In this case, the monitor will not register full press tonnage. Compressive preload on these tie rods holds the press structure together to approximately 200 percent of press capacity. In the event of a large overload, the safety factor will be exceeded and the tie rods will stretch, allowing the crown to lift from the top of the columns. This serves much like a safety valve to protect the other press parts. The amount of force developed in a catastrophic overload is limited by the yield strength of the tie rods. If the tie rods are stretched but not damaged, they can be retensioned. …of the press tie rods is essential to ensure the proper operation of a straightside press. Most press service manuals explain the correct procedure. It is very important to tighten each tie rod correctly and equally. An accepted practice throughout the industry has been to prestress press tie rods to 0.0007 in./in. (0.0084 in./ft., or 700 microstrain). The tensile stress developed in a mild-steel tie rod at this strain level is approximately 20 ksi. If heat is used to shrink the tie rods, actual stress will be somewhat less once the press members have cooled, due to the elasticity of the members held in compression. Fig. 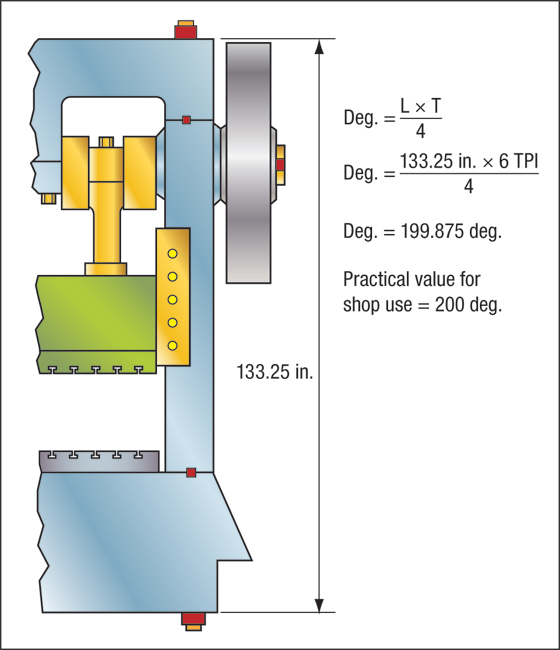 2—Stampers can use this practical shop formula to determine the required degree of tie-rod preload. Fig. 2 illustrates the application of a practical shop formula used to obtain the correct tie-rod preload. The constant “4” is universal and is not to be confused with 4 TPI (threads per inch of the tie rods). Stampers should use this formula to determine the amount of rotation needed for each nut (200 deg. ); measure the required number of degrees with a protractor and mark it with chalk. If the top nuts require adjustment, the tie rods will need support. The tie rods then can be heated and the nuts adjusted. Presses designed for tie-rod prestressing with a torch have access holes in the columns or uprights through which the flame can be applied to the tie rods. Prior to heating, be sure to thoroughly clean any oil, grease and debris out of the column and press area. Also, keep portable fire extinguishers on hand and post a watchperson to observe the press pit during the heating process. Place mineral fiber insulation between the tie rods and sides of the columns to keep the uprights as cool as possible. This will decrease the amount of heat needed to expand the tie rods and help avoid damage to oil lines and wiring. Beware of wiring located too close to the areas being heated, and disconnect and pull wiring out of the as needed. Serious accidents and costly damage can result from damaged press wiring caused by careless tie-rod heating. Fig. 3—This sectional view illustrates installation of hydraulic tie-rod nuts. Heat all four tie rods gradually, moving the flame from one to the other in turn. Allow sufficient time for the concentrated heat to be conducted along a substantial length of each tie rod; for larger work, shops may require more than one torch. Take care to avoid overheating the work—if a small area of a tie rod receives excessive heat, the material may yield as the tie rod shrinks, resulting in insufficient prestressing. Before returning the press to service, allow the tie rods to cool completely and inspect for proper press alignment. Stampers with presses outfitted with tie rods drilled for electrical tubular heaters (Calrod heaters, for example) can employ these for heating the press elements. Here it is important to have a set of four heaters available, as well as the required electrical current available. Ensure that the holes are free of oil and debris before inserting the heaters and initiating the heating process. Exercise patience, as it can take 30 to 60 min. to sufficiently heat and expand the tie rods to permit tightening the nuts as required. Just want to say your article is as surprising. The clearness in your submit is simply cool and i could suppose you're an expert on this subject. Well along with your permission let me to grab your RSS feed to keep updated with coming near near post. Thanks a million and please continue the rewarding work. The data mentioned above is very helpful. It would be much better if I can speak/mail the technically knowledge person regarding the nut opening.